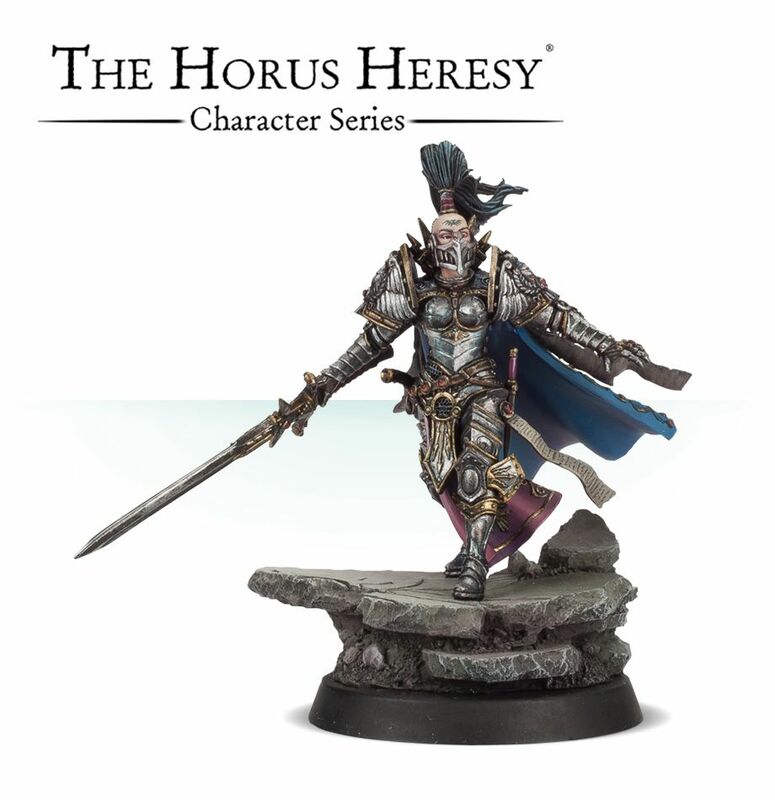 Ein neues Modell aus der The Horus Heresy Charakter Series, Jenetia Krole, Knight-Commander of the Silent Sisterhood erscheint diese Woche von Forge World. Assassin, general, avenger and soul-chilling terror, Jenetia Krole was a creature of dark legend long before she was committed as part of the honour guard tasked with the retrieval of the Primarch Magnus. Upon the battlefield of Tizca, Krole was personally responsible for the division of her ranks into protectorate detachments for the remainder of the Censure Host, a matter which allowed them to ensure the near-destruction of the Thousand Sons Legion at the sacrifice of thousands of her troops, while she herself sought out and slew many of the Thousand Sons’ most vaunted sorcerers in hand-to-hand combat. By the time of the battle’s ending, she appeared a spectral figure of some ancient myth, bedecked in the white dust of shattered marble and the spilled blood of multitudes. 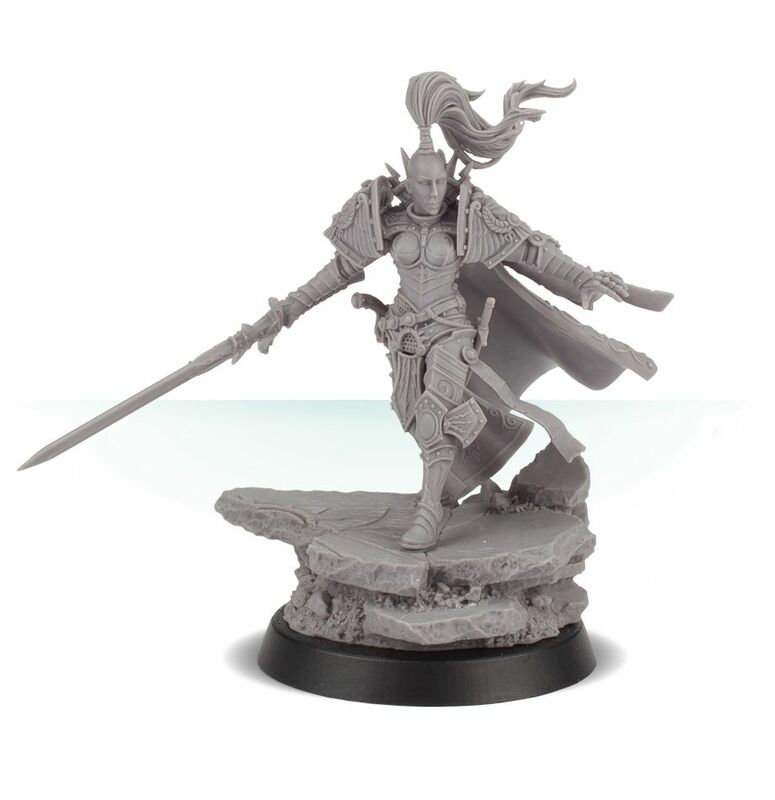 This multipart resin kit contains the components necessary to assemble Jenetia Krole, Knight-Commander of the Silent Sisterhood, who can be added to Talons of the Emperor armies. 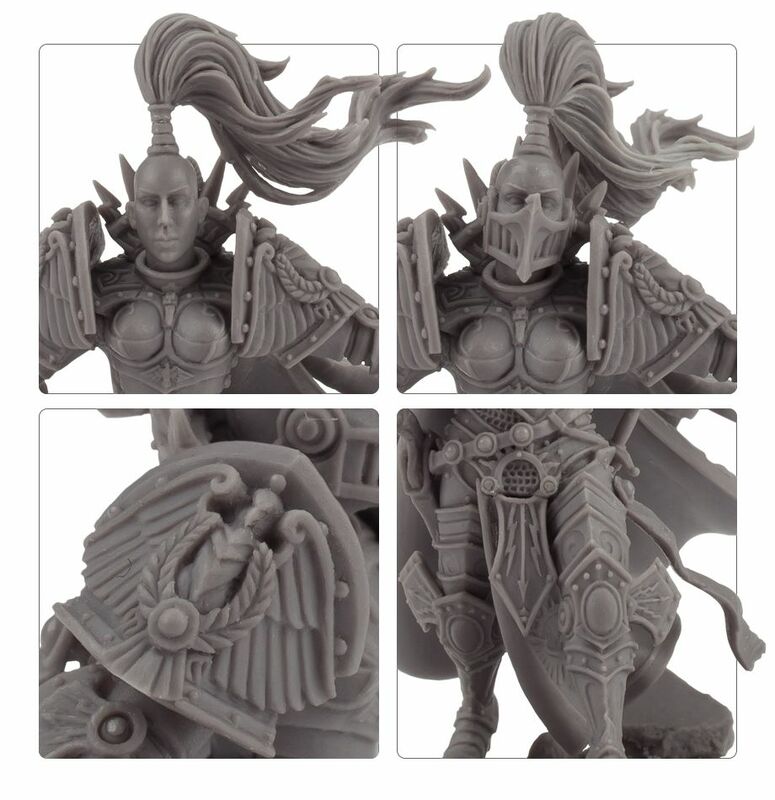 Wearing ornate artificer armour covered in Imperial iconography, with an enhanced voidsheen cloak, she carries the Sword of Oblivion in her right hand – this is a hefty blade indeed, the length of Jenetia’s arm and half again. Stowed on her hip is an archaeotech pistol, whose holster is attached via a jewelled leather belt. 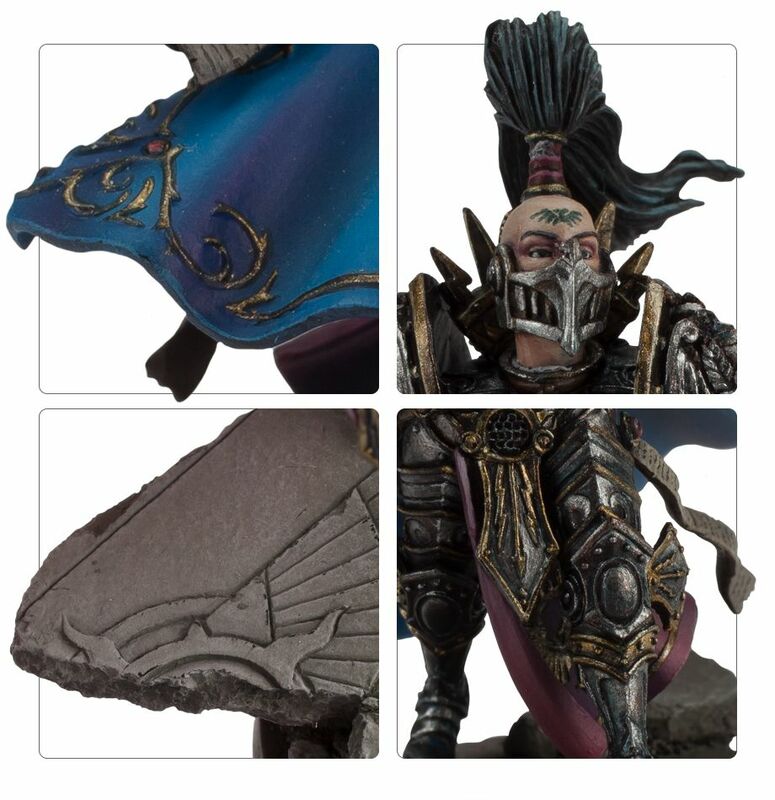 The voidsheen cloak that billows out behind her has 2 attached purity seals, and Jenetia features a choice of 2 heads – 1 features a protective metal mask which shields the lower half of her face, the other head is bare; both heads are supplied with their own distinct hair options. The model is supplied with a 32mm round scenic base, featuring a large, rocky outcrop. 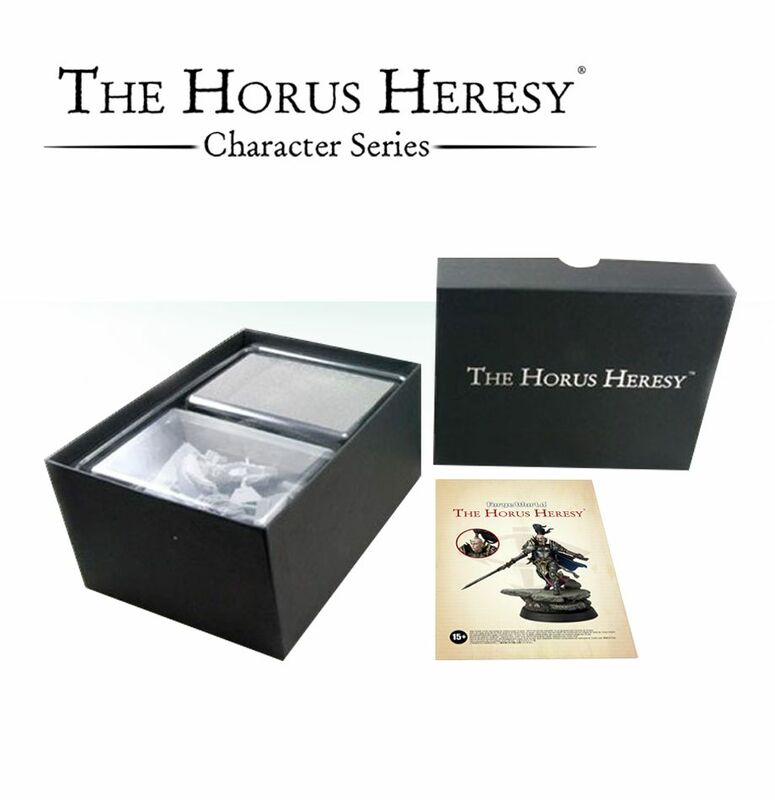 Rules for Jenetia Krole, Knight-Commander of the Silent Sisterhood are available in The Horus Heresy Book Seven: Inferno. Eine Schwester mit ein paar mehr Details zum Preis von 10. Bei den Marines hat man ja meist immerhin noch eine besondere Ausrüstung/Pose, aber die hier finde ich einfach nur lahm. Sieht ok aus, aber nicht für 45 Euro. Außerdem finde ich das Gesicht der stillen Schwester ohne den Kieferschutz nicht gerade ansprechend, da zu schmal und lang. Sagt mal, kann die vielleicht mal jemand kneifen, dass sie aufwachen? 45 Euro für ein kleines Püppchen mit einer Baseauflage????? gute Idee, so kann man sein Geld sinnvoller anlegen. Mit Maske finde ich Sie eigendlich schick, aber 45 Tacken is mir das nicht wert.